Richard Diebenkorn, Ocean Park #27, 1970, oil and charcoal on canvas, 100 x 80 inches, catalogue raisonné no. 4016. In 1966 Richard and Phyllis Diebenkorn moved from Berkeley to Santa Monica, a move that coincided with the end of their child-accompanied years. Diebenkorn had accepted a position on the art faculty of UCLA, whose department director, Frederick Wight, promised that his administrative duties would be minimal, and his relation to studio artist pupils, open-ended. (This promise proved to be unfulfilled; Diebenkorn would be embroiled in far more faculty and administrative issues than he’d bargained for.) For the first few months the couple rented a relatively modest bungalow near the ocean while they looked for a more permanent residence. (See the artist’s rendition of this house in cat. 3902.) They soon found a congenial Mediterranean-style house on Amalfi Drive in Santa Monica, in a canyon fairly close to the sea, and convenient to the UCLA campus. They would live there for twenty-one years. The artist set up his studio in a semi-industrial neighborhood in nearby Venice. In those days an unpretentious, diversely populated seaside community, Venice was beginning to attract artists seeking affordable studio space, among them Robert Irwin, Ed Moses, Kenneth Price, and Billy Al Bengston. Its first glory days as an artificially planned “canal resort” were long past, and it had yet to become the fashionable community that the incursion of artists from the 1960s through the 1990s has made it now. Diebenkorn took over part of a second-story walk-up above an appliance store at the corner of Main Street and Ashland Avenue. The artist Sam Francis had long occupied the whole space, but when Diebenkorn moved in, Francis was no longer living or painting there full-time. (Occasionally Diebenkorn would be aware of Francis’s presence late at night, but the two artists, though cordial, didn’t really connect in their shared place.) Diebenkorn initially occupied a small section of the space that had no exterior light, so his first works there were small in scale, probably all drawings. After a few months, he took over a much larger section of the high-ceilinged building, with windows facing north and west, on one side offering a view of a parking lot. One of the characteristics of these windows—metal-framed glass panels that opened outward, supported at their lower edge by a projecting bar—was their slanted angularity. The 1970 painting titled Studio Window—Ocean Park (cat. 4014) records one version of this view. More than one writer has claimed that the various shapes suggested by these windows—triangles, parallelograms, diamonds, rhomboids—reverberate in the prolonged series of drawings and paintings that Diebenkorn executed in this Ocean Park studio. There is truth in this myth of origin, but it has become overdetermined in the lore of the artist’s formal progression. Many, mostly unknowable, factors legislated the unfolding of the Ocean Park geometries. The first year or more of Diebenkorn’s time in the Ashland and Main studio, where he would remain until 1974, was transitional in several ways. In the beginning he worked in a limited space. Although he knew that this was a temporary situation, he needed, as always, to quickly establish an intense working schedule. It took some time for him to properly set up two large wall-mounted canvas easels, and a separate space for drawings. Probably in part because of this relatively circumscribed spatial environment, many of the pictures he made in the first Ocean Park studio were representational, recording elements of his new environment, notably a few landscapes and views from windows, such as the rooftop scene depicted twice, in 1969 and 1974 (cats. 3995 and 4149). Often in the past Diebenkorn had relied upon familiar objects or views to inspire his compositions; now he began to use that technique in a new stripped-down, hybridized synthesis of the representational and the abstract. Studio Window—Ocean Park epitomizes the best transitional works of a period that was itself literally transitional. It is difficult to know the precise progression from representational to abstract work between 1968 and early 1970. What we do know is that within less than two years in the Ocean Park studio, the artist gradually made a full commitment to abstraction. It is as though, anticipating the expansion of both his physical space and his compositional format, he employed glimpses of his newly familiar surroundings to move into a radically changed thought process. Diebenkorn’s advancement into a new visual language evolved gradually, fed by varying impulses. The window-structure reference wasn’t the only one he appropriated from his immediate surroundings; he also maintained a line of landscape-referent imagery. Throughout 1967 and 1968 the artist wrestled equally with ideas suggested by vistas and those associated with still life, or interior, views. The process of settling into, or fully defining, the necessary vocabulary for the Ocean Park painting series occurred well into the numbering of them. (From the outset, Diebenkorn kept track of these canvases with a simple numbering system. Not every numbered work ended up in the completed series, and at least once, a canvas was inserted with a ½ status.) Several early works in this great painting cycle represent replete forays into a geometric and chromatic territory that would become richer and richer over ensuing decades. The Ocean Park series of paintings was well under way by 1968; such fully realized works as Ocean Park #9 (cat. 3981) and Ocean Park #16 (cat. 3987) of that year testify to how rapidly Diebenkorn mastered the format and underlying structure of this phenomenon. A seminal early work, in terms of declaring a new kind of spatial understanding, is Ocean Park #27, finished in 1970. 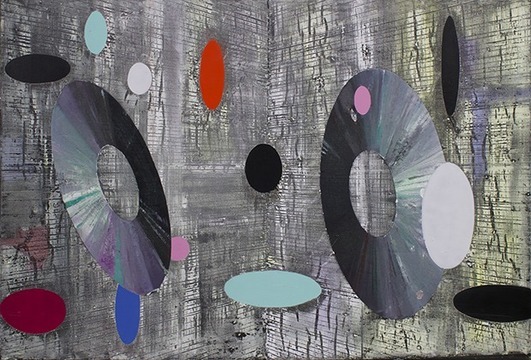 This work exemplifies the artist’s fascination with the space-altering shapes following from the “slanted window” idea. But we sense many more layers of thought in the realms of chromaticism, translucence, and space/surface ambiguity. By this time Diebenkorn had announced the ongoing issues (usually expressed as tensions) that continued to engage him for the next decade, in both his paintings and works on paper: planarity (flatness) versus illusionistic space; chromatic dissonance versus harmony (always subtly played out); bold, wall-commanding size versus more intimate scale. (Diebenkorn said that his Ocean Park canvases were sized, at their largest, just within the boundaries of what his limbs could reach. This meant, in general, a vertical maximum of 100 inches and a horizontal one of about 82 inches.) A drawing from the same year, Untitled #15, offers some intriguing comparisons between the artist’s approaches to large canvases and to intimately scaled works on paper. 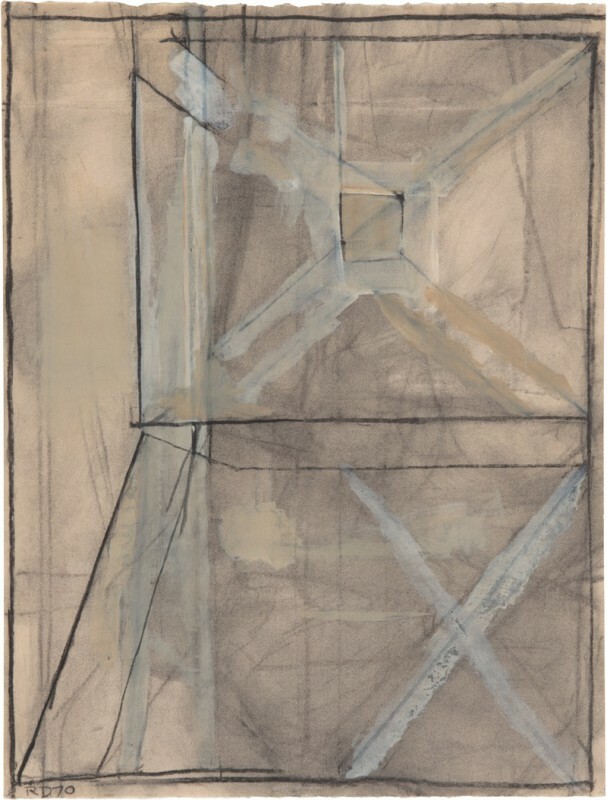 Richard Diebenkorn, Untitled #15, 1970, charcoal and gouache on paper, 24⅞ x 18⅞ inches, catalogue raisonné no. 4044. Ocean Park #27 is a classic case of a fully resolved large-scale oil painting whose subject might at first be interpreted as flatness itself. Although he wasn’t one of the artists Clement Greenberg cited to illustrate his theory that flatness was essential to the new “integrally literal” nature of modernism, Diebenkorn was naturally aware of the contemporary zeitgeist. Flatness and literalness entered into the ascendant critical vocabulary of the 1960s and ’70s, made quintessential by Greenberg and the artist Frank Stella. For them, illusionistic space in painting was simply inadmissible. Diebenkorn—deliberately or not—responded to the argument by declaring his own allegiance to Stella’s (and Ellsworth Kelly’s) insight: he embraced a certain decorativeness (another Greenberg dictum) in the project of composing large, flat canvases. But there are subtle differences in Diebenkorn’s flatness and decorativeness. The Ocean Park paintings would never fully enter into the realm of American post–Abstract Expressionist painting as adumbrated by Greenberg and others, for they are about something entirely different from the large, “literal” canvases of Stella or Kelly or Helen Frankenthaler or Morris Louis. Just how this difference is calculated remains one of the mysteries of their enduring ambiguity and power. In his abstract works, Diebenkorn rarely tipped his hand as to any conscious preoccupation with spatial illusionism—he preferred to imply rather than spell out his permutations of push-and-pull. Some of the impetus for the ubiquitous reworking in his abstract paintings and drawings may have to do with this wish for perspectival ambiguity. It is for this reason that Untitled #15—essentially a black-and-white (or properly, black-and-gray) composition—claims a nearly unique place in the artist’s oeuvre. Here we may glimpse an explicitly worked out “three-dimensional” composition that almost carries an aura of coded messages to the viewer. It might hint at some of the enigmas of the artist’s work of the early to mid-1970s. Both the spatial character of this drawing and the nature of its media are more complicated than they first appear. This is not just a drawing in charcoal and gouache; it incorporates a small element of collage, often a sign that a drawing has a special place in Diebenkorn’s intellectual and aesthetic hierarchy. Although Diebenkorn was careful with his art supplies, he was not obsessed with the purity or compatibility of his physical media. Although he had favorite brands and colors and used all the tried and true artist’s materials—ink, gouache or watercolor, pencil and charcoal, or standard acrylic (“synthetic polymer”) paints on paper, and oil-based pigments mixed with turpentine on canvas, on which he sometimes also incorporated charcoal—he wasn’t so much punctilious as pragmatic in his choices. He was always willing to experiment, to combine, to discard and then reuse. Most of all, he never hesitated to layer his media. The problem of identifying exact physical substances when cataloguing his thousands of drawings reflects the artist’s pragmatic application of whatever media worked for him in whatever he was looking for in a given drawing or painting on paper. Our decision to compare this particular canvas and drawing is suggested by their different use of both illusionistic space and—more importantly—the shapes that were part of Diebenkorn’s Ocean Park vocabulary. If anything, geometric blocks, in myriad configurations, are even more important than space in many of the Ocean Park works, whether on canvas or paper. It is instructive to ruminate on the artist’s endless use of the parallelogram, cropped or complete, or the triangle; it is equally useful to recognize certain linguistic symbols. Although the X in Untitled #15 has a centrality that it is rarely given in any canvas, the more we study these two compositions, the more we perceive their structural relationships. Both utilize a truncated parallelogram; in both, the horizontal axis is anchored a little below center. It is superficially easier to compare like with like, but perhaps more revealing to contrast canvases that are insistently flat and paintings on paper that are tantalizingly, illusionistically three-dimensional. The drawing offers clues to the derivation of the ubiquitous, one-sidedly angled form—it comes from classical methods of suggesting the third dimension with line. And yet, as we clearly see in Ocean Park #27, the artist uses these methods in the service of a new kind of abstract painting, one that eschews illusionistic depth. 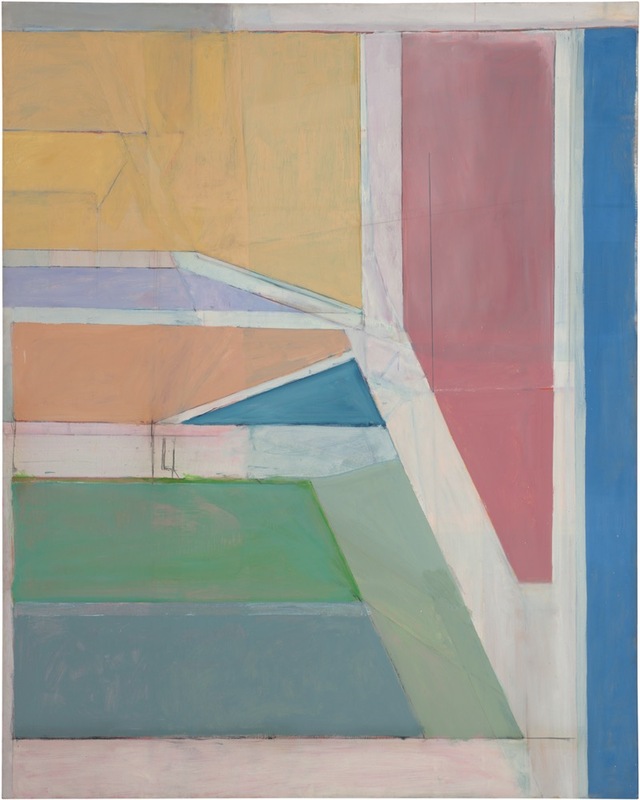 Richard Diebenkorn’s command of spatial complexity in an abstract matrix—gleaned in large part from his years of painting interiors, peopled or not, tabletop still lifes, landscapes literally observed and partially imagined, and figures in almost unimaginable number—is elaborately played out in his later abstract compositions. To understand the fascination of the Ocean Park works, both paintings and works on paper, we must fathom some of the preparation that informs them, and contemplate their spatial fundaments. From RICHARD DIEBENKORN: THE CATALOGUE RAISONNÉ, edited by Jane Livingston and Andrea Liguori, published by Yale University Press in October 2016. Reproduced by permission. Reprint from ARTNEWS, 18 October 2016, Copyright 2016, Art Media ARTNEWS, llc. All rights reserved. 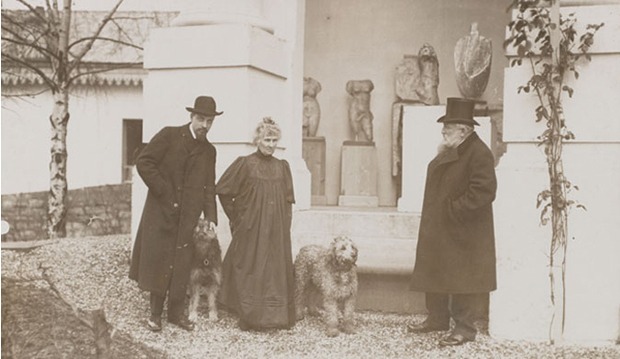 Rainer Maria Rilke (far left) with Auguste Rodin and the sculptor’s long-time companion Rose Beuret. How can such advice not betray itself? Kappus, Rilke must have known, had already looked within, and had found himself wanting. What the young poet needed was something from without to make his thoughts complete. Bois, too, in reflecting on Barthes, wrote of how he “didn’t only want to quote” his master, but to “use his text in a sort of trusteeship,” to seamlessly assimilate Barthes’s ideas into his own. Kappus and Bois, like all disciples, sought from their teachers not just advice, but models to be emulated and absorbed. They wanted to know: how should one think? How should one live? Such questions enliven serious writing, and they underpin Rachel Corbett’s splendid new book, You Must Change Your Life. In the most basic sense, it is a chronicle of Rilke’s intellectual apprenticeship to his own master, the sculptor Auguste Rodin. Deftly, and with great accessibility, Corbett describes their early lives and work; their first meeting on the artist’s estate in 1902, as Rilke prepared to write a book on the sculptor; the poet’s enchantment with Rodin, who implored the writer to leave the world behind and “work, always work”; their falling out, in 1906, over a trifling matter; and Rilke’s ultimate realisation that his tutor did not have everything he was looking for. At the bottom of it all is a moral position: that life and art teach us about one another. This is the foundation not only of Corbett’s book, but also of the entire genre in which she is working; literary biography, indeed, assumes that an account of one’s struggles and loves and desires and fears can illuminate something about his work. What follows is the delicate dance of sensitivity and empathy: how fully can a writer inhabit the mind of an artist? How deeply can she see through his life into his work? It is easy to assume a false equivalence between biography and criticism, as if one can be mapped perfectly on to the other. I think of Harold Rosenberg, who argued in 1958 that Abstract Expressionism had “broken down every distinction between art and life” and that, as a result, “anything is relevant to it.” But who truly believes that “everything” is relevant to any one thing? To truly know that art and life are related is to ask about the nature of their proximity, not to assert it. The real problem is, if the two are intertwined, where does their mutual influence begin and end? This is one of the many moments in which she writes not just about Rilke, but through him. Whole sections of the book are done in this free indirect style, wherein Corbett dips into Rilke’s consciousness and imagines it aloud. She identifies with the poet more so than she does with the sculptor and there are moments, especially early on, where her attempts to dwell in Rodin’s thoughts are less fruitful. Part of the problem is the false suspense that animates all biographies of successful figures. 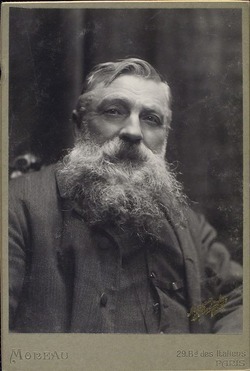 In describing Rodin’s early schooling, Corbett writes of how he quailed at the “sculpt-by-numbers” style of teaching that characterised the academy: “Once he caught a glimpse of himself in the mirror and for a moment saw himself as his uncle, who had also been a plaster craftsman and wore a smock streaked with white paste. He was starting to believe that this job might be for him. Perhaps he had been foolish to think he could be an artist.” Yet we all know how his story ends. 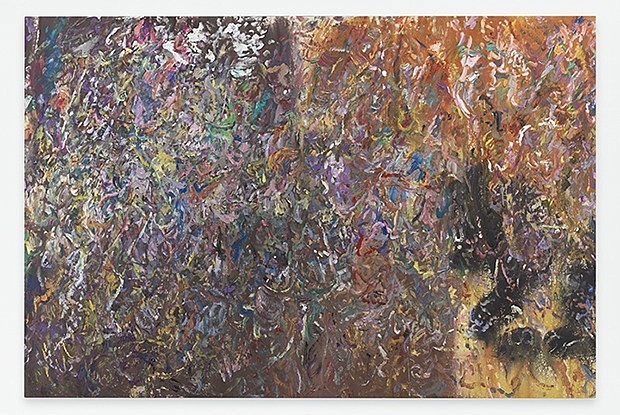 Larry Poons, Cousin Durrell (2015), © Larry Poons. The below excerpt is taken from the art critic and historian Barbara Rose’s catalogue essay for Painting After Postmodernism, an exhibition of 16 American and Belgian painters—including Walter Darby Bannard, Larry Poons, Werner Mannaers and Joris Ghekiere—whom Rose sees as making a serious case for the continued relevance of painting in our digital age. The exhibition is on through 16 November at Vanderborght and Cinéma Galeries/the Underground in Brussels. Joris Ghekiere, Untitled (2016), © Joris Ghekiere. Ironically, it was a photographer who defended the capacity of painting to endure. The historic first exhibition of the Impressionist painters, held in the studio of the portrait photographer Nadar in 1874, proved that photography did not kill painting, but rather that painting could redefine itself as a viable and progressive art form by concentrating on visible brushstrokes that call attention to variable tactile surfaces whereas all photographs share a uniform, slick printed surface. Today, ambitious painting confronts an analogous situation as fast moving pixilated imagery challenges its values and practices. Available to all, and not just to the trained and educated, digital technology appropriates, recombines, and recycles images in often surprising and novel visual combinations that create flashy, momentary, instantaneously consumed images that shock and awe. But reactions to these images, no matter how striking or gut wrenching, are short lived and fugitive. Fine art that is durable, remains in museums and collections after its authors are long gone, requires a more lasting, profound, and transformative involvement. The same year Delaroche claimed that photography would replace painting, Stendhal dedicated his great complex and layered novel The Charterhouse of Parma to “the happy few.” Today, serious artists making equally complex and layered works, requiring years of skill and training, confront the same lack of understanding that faced the Impressionists and Stendhal. In the context of electronically communicated mass culture, the face to face confrontation, and the extended amount of time required to digest, dense and multifaceted artworks are out of step with the standards of the dominant culture of instant gratification and easy entertainment. I have no idea whether in a hundred years their works will endure. This exhibition is a wager that they will. I began to think of presenting contemporary American painters together with their Belgian counterparts when I noticed that there were artists working in both countries to reinvigorate painting by expanding its parameters, as well as by building on its foundations, with a respect for fine detail and careful craftsmanship. The issue is not whether the work is abstract or representational, but rather on the type of space being created, and on the redefinition of imagery within that space. After visiting scores of exhibitions and studios in the USA and Belgium, I found that exciting new work was based on expanding the processes of painting as a means to evoke imagery that was not a priori and schematized, but rather provocative and open to individual interpretation. In the early 1960s, with the aim of democratizing art, “Pop” artists turned their backs on abstraction to employ familiar imagery, signs, and symbols of popular culture requiring no education to understand. The rationale that Pop Art was a critique of commodity culture quickly turned in on itself when the masses embraced its graphic imagery and simplified poster like legibility, which has more in common with the two dimensionality of printmaking and advertising art than with the complex space of painting. However, the popularity of Pop images did gain attention for painting. This changed in the late 1960s and throughout the 1970s, when once again it became fashionable to denounce painting as an irrelevant relic of bourgeois culture. In this climate of political correctness, museums and galleries rushed to embrace forms of “radical art” that illustrated various ideological platforms. A further attack on painting as a form of retarded decoration was launched by literalist, anti-illusionistic Minimal Art, which unlike the vacuous, bright, and shiny surfaces of Pop Art, had a philosophical grounding in phenomenology and Gestalt psychology. Then in the highflying 1980s and 1990s, nouveau riche collectors gorged their famished appetites for garishness on Neo-Expressionist figuration, to the point of elevating graffiti as painting. With fine art clearly losing ground, and the happy few becoming ever fewer, museums, increasingly dedicated to enlarging paid attendance, and most galleries, whose purpose is profit, favoured easily consumed popular styles. The result was that the difference between high and low art was gradually but consistently erased, beginning in 1990 with the Museum of Modern Art’s exhibition High and Low: Modern Art and Popular Culture. Suddenly, art had a huge popular audience in New York, but the center of painting had been displaced to Berlin, where a postwar generation including artists Georg Baselitz, Anselm Kiefer, Markus Lupertz, Sigmar Polke and Gerhard Richter redefined— in contemporary terms—the painterly, expressionistic style characteristic of German art. Their monumental painterly work, however, was disregarded by the dominant American art critic of the post-World War II era, Clement Greenberg, the hero of a generation of critics trained as art historians in the leading universities of the USA. The importance of Greenberg as a tastemaker cannot be overstated. A brilliant writer and a powerful, domineering personality, Greenberg’s lean and elegant style immediately seduced readers. Among his first essays, Towards a Newer Laocoon, published in the Partisan Review in May 1941, argued for the supremacy of abstract art as a means to maintain the purity of painting by distinguishing itself from the other arts. Isolating the unique properties of a medium to preserve its purity became central to Greenberg’s critical judgments. The struggle of the avant-garde thus became the fight to escape from literary subject matter. In his reviews in The Nation, for which he wrote weekly from 1942 to 1949, he insisted that in order to remain “pure” and uncompromised, painting must be addressed to eyesight alone. Subject matter was a primary distraction, but so was any inference of spatiality. Toward this end, all traces of the hand were to be expunged in favour of instantaneous retinal impact. For Greenberg, Jackson Pollock’s poured and dribbled “allover” paintings created a disembodied, optical web experienced exclusively in visual terms. Rejecting the gestural style of Willem de Kooning, trained in Amsterdam’s highly reputed Rijksakademie van beeldende kunsten to appreciate the painterly styles of Rembrandt and Rubens, Greenberg hailed Pollock as the master of the future, not the past. For the next fifty years, Greenberg pursued this argument, convincing his growing group of admirers of its ineluctable truth. Walter Darby Bannard, He Loves Me Not (2009), © Walter Darby Bannard. In Europe, on the other hand, especially in Belgium and the Netherlands, the example of painterly painting based on visible brushwork was part of their own historic tradition, which continued to be taught in the fine art academies at a time when Americans were obsessed with newness. However, painting was also being attacked in Flanders by the Belgian art historian Jan Hoet, who like Greenberg, was a failed painter attracted to power strategies. If Greenberg was called “the art czar,” Hoet was known as “the pope of art,” whose mission was to marginalize paintings in favour of installations and new technological media. Obviously, as an American, I am more familiar with Greenberg’s interpretation of Modernism than I am with the texts read by Belgian artists. My impression, however, is that in Belgium—due to its rich and deep-rooted heritage in the art of painting—artists continued to be educated in practical skills, even when they were rejected by cultural impresarios like Hoet, who dominated recent Belgian art as much as Greenberg served as a gatekeeper to success for English speaking artists. In the USA, artists were not scorned as painters, but rather as heretics from Greenbergian dogma. In Belgium, Hoet, easily as powerful a tastemaker as Greenberg, used his political connections to expunge painting altogether in favour of conceptual installations and technology based media drawn from the distant corners of the world without respect for quality or durability. Hoet concentrated on actions, not words, making his mark in a newly prosperous Europe, whereas Greenberg made his arguments in print and in lectures throughout the English-speaking world. In 1964, Greenberg organised the exhibition Post Painterly Painting at the Los Angeles County Museum of Art, insisting that what was new about recent painting was its emphasis on brilliant colour over physical gesture. The artists selected, according to Greenberg, shunned thick paint and tactile effects in the interests of optical clarity. It is true that following Pollock, many younger painters abandoned conventional paintbrushes, which emphasized the tactile stroke. Included in the show, Walter Darby Bannard was among the first to renounce the paintbrush in favour of squeegees, rakes, and brooms, which he used to apply mixed media and gels that thickened the surface to literal relief. Larry Poons, whose early paintings of highly coloured stained fields punctuated by dots and ellipses of contrasting hues that corresponded to Greenberg’s criteria, declined to be included. 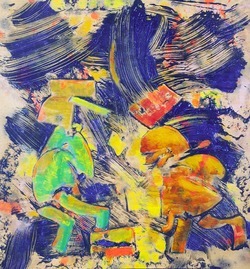 Originally a student of composition at The Boston Conservatory of Music, Poons began painting as a geometric abstractionist with compositions, like those of Ed Moses’ early works, which recall those of the Fleming Vantongerloo and the Dutch Van Doesburg, both proponents of the Neoplastic group De Stijl. Abandoning the colour fields of his dot and ellipse paintings in the late 1960s, Poons began flinging paint across his canvases, controlling thick layers of pigment with expert dexterity. Gradually, his pictorial surfaces became increasingly emphatic as he loaded them with inert materials that create three-dimensional relief. In the early 1960s, both Bannard and Poons were lauded as Minimalists; by the end of the decade, they were creating literal pictorial surfaces that were as textural as they were optical. In Poons’ case, the material relief of the surface became increasingly pronounced, to the point that shadows accumulated in crevices thus producing chiaroscuro. Their concerns with tactility and surface texture pointed to a direction that advanced painting would begin consciously to pursue. In the late 1960s, Greenberg’s insistence on absolute flatness was also challenged by geometric painters like Ron Davis and Al Held, who invented ways of using perspective, the basis of illusionism, in a self-contradictory manner that subverted any reading of space behind the picture plane. At the same time in France, the Supports/Surfaces group was deconstructing painting into its constituent elements by detaching the canvas from its supporting stretcher. Beginning in the 1980s, Greenberg’s purist dogma was challenged on all fronts. European critics, such as Achille Bonito Oliva, first used the term “Postmodernism” to champion Italian Transavanguardia painters, who mixed historical styles in pastiche figuration. Frederic Jameson characterized Postmodernism as a breakdown of the distinction between “high” and “low” culture by appropriating the kitsch imagery of mass culture in quotations and reproductions. If, in the 1930s, Greenberg exposed the antithesis of kitsch and the avant-garde, a half century later, Postmodernism now made it possible to identify the two. The first major defector from Greenbergian orthodoxy was Poons, who began spilling heavy coats of thickened pigment, layering surface upon surface, until a relief high enough to cast a shadow was built up. Serious painters were seeking alternatives to Greenberg’s disembodied abstraction addressed to eyesight alone. Realizing that this narrow doctrine collided with the desire to retain the wholeness of the aesthetic experience made available by the Old Masters, they focused on the haptic quality of sensuous painterly surfaces, as well as on the optical fusion of colour and light, by experimenting with new kinds of materials and a variety of techniques analogous to the physical processes that the Surrealists used to evoke surprising images. Paintbrushes were abandoned for rags, sponges, mops, and spray guns. Stencils were used to mask areas that once removed did not depict images but left contoured shapes whose edges were not drawn but emerged from the process. Miró’s concept of automatism as a means to experiment with materials and techniques, allowing the image to emerge from the process, anticipates the frontiers of serious painting today. Like Miró, the painters in this exhibition do not preconceive and depict shapes, but rather allow them to emerge from the process of creation. Describing his method of organising chance improvisation with stable structure, often combining linear looping and flat contoured shapes, Miró remarked, “The works must be conceived with fire in the soul but executed with clinical coolness.” He permits spills and blots to evoke pulsating forms. Miró’s paintings may look casual, but the disposition of elements is like in those of the Old Masters. He causes the eye to travel across the surface along axes and paths that visually link form to form. Miró challenged and threatened the Cubists: “I shall break their guitar.” And indeed, with his fearless experimentation, one might say that Miró certainly did. Given what we are seeing today, Miró may well have been right. His new method of working involved loose brushing, spilling, and blotting thinned-down, liquefied paint in conjunction with cursive, automatic drawing punctuated with shapes that were frequently vaguely geometric. The sense of an immeasurable cosmic space is common to the imagery of a number of the painters in this exhibition, both Americans and Belgians, such as Walter Darby Bannard, Joris Ghekiere, Bernard Gilbert, Karen Gunderson, Lois Lane, Paul Manes, Werner Mannaers, Marc Maet, Bart Vandevijvere, and Jan Vanriet. The manner in which the artists in this exhibition actually work is often a mystery because of the number of different techniques that they employ to apply and remove paint. These are not what Greenberg referred to as “one shot” paintings, executed so quickly that they are finished the moment that the single coat of stained colour dries. On the contrary, each painting is worked on over a period of time, its composition assessing and reassessing the balance, seeking equilibrium through subsequent retouching. Each part has to function successfully within an integrated surface. This is the challenge that Cézanne gave himself, constantly reviewing and readjusting his paint patches and their closely valued colours until he achieved the desired equilibrium over a period of time. Minimal reductiveness can now be seen for what it is: a transitional step in the history of art, one necessary in order for painting to gain new freedom in favour of the play of the imagination. This new kind of pictorial space is allusive and not literal. The picture plane is recognizably flat, but on it, or in it, float any number of individual visions of a space that is neither that of the academic illusionism of the past, nor that of painting as a strictly literal object. New interpretations of texture and space, with their connotations of both tactility and metaphor, obviously vary from artist to artist. The artists in this exhibition work alone, slowly and painstakingly, revisiting their compositions many times. Their works are made in a slow process and require time to be digested by the viewer. They slow down rather than accelerate time. What they have in common is a syncretic attitude that conserves that which remains vital from the art of the past by analyzing and distilling the essence of the pictorial.